As I’ve mentioned before, I swap quite a bit with Swap-Bot. I love getting fun mail, it makes an ordinary day much happier. I run a smaller subgroup which allows like-minded people to have even stricter rules and swap specific themed items which is fun but lots of work. One of my groups is Matchbox and More and I hosted a swap to make a doll bedroom. The requirements were to use a matchbox as a bed, make a floor and two walls, one with a window and decorate the window and the room in general. And make or buy ‘someone’ to ‘live’ in the room. The matchbox used is approximately 2×1.5×0.5” so it’s pretty small. I used swatches from an online fabric store to make the sheet and blanket. The bottom of the blanket is loose so the drawer can come out then tuck back in. 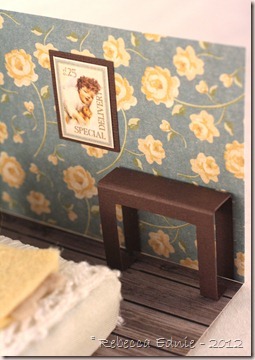 The headboard is actually part of the matchbox sleeve that folds up. The room was sent flat so it is hinged on two sides but only temporarily adhered on the third side. The table is designed to fold flat too. 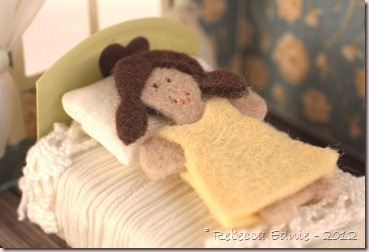 The doll is made from felt and her features are sewn on using thread as even one strand of embroidery floss was too thick! The curtain rod is part of a BBQ skewer and the curtains are more sample fabric with brad tie backs. The outer part of the window was cut with a square die but I didn’t have a die that perfectly cut the inner squares as the muntin bars would have been too thick so I used a die to cut the outer part of the square then trimmed the rest with an x-acto knife. If you ever decide to join Swap-Bot, look me up. My username is thebragal. OMG…what a fabulous project, Rebecca!!! 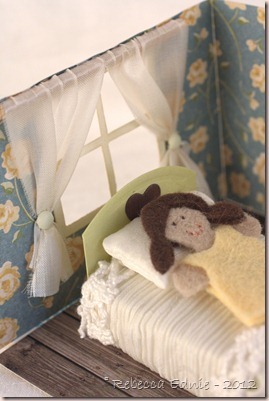 The little felt doll is adorable and what an awesome room you created around her…you are sooo clever!! !